This Cheesy English Muffin Bread is an easy to make bread that comes together quickly and is full of cheddar cheese! It bakes into a beautiful loaf that’s perfect for toasting. 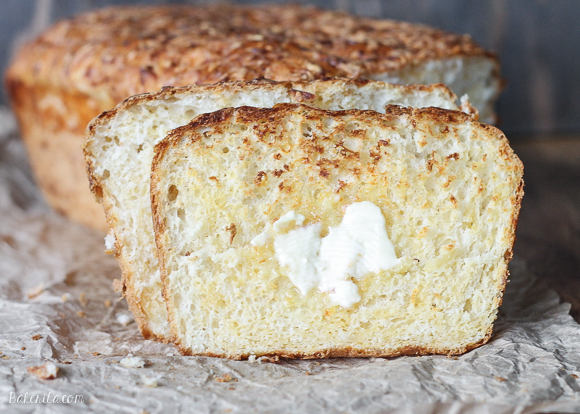 Editing the pictures of this cheesy english muffin bread is making me seriously wish I had some more of it right now. I’ve been loving making breads recently (you saw my blueberry bagels a few weeks ago, right?) and I especially love it since I’ve discovered instant yeast. Instead of having to proof yeast, which I always stressed out about, you just stir it in with the flour and add your hot liquid. Voila. Stress free! I don’t like having to wait ages for my bread to be ready either – I don’t want to wait forever for the dough to rise, or double rise. Thankfully, this recipe has one rise, and it’s only 45 minutes to an hour, depending on the temperature of your kitchen. Less than a half hour of baking time and only a few minutes to stir things up leaves you enjoying this bread in less than 2 hours. And enjoy this bread you would. Crisp and cheesy are the best words to describe that golden exterior crust, and the inside is super fluffy, with that awesome english muffin texture. The bubbles are smaller than what you see in a regular english muffin, but this bread definitely still has little nooks and crannies for your butter to melt into. Of course, there’s also 2 cups of cheddar cheese dispersed throughout the loaf, giving the whole loaf a mild cheddar flavor and delicious melted cheese swirled throughout. Where the cheese really shines is the crust, so save the end pieces for yourself. They get cheesy and caramelized and it’s so so good. Also, this bread slices easily and does great in the toaster. It makes the cheese liven up a bit and helps the slice get a delicious golden brown crispy crust. Top with your butter, or cream cheese, or whatever you want really. ORRR make a grilled cheese! <— you should totally do that. I wanted to, but the bread was gone before I got the chance. But, if you make this, make a grilled cheese, and send me pics. Speaking of sending pics, sorta, I love to see when you guys make my stuff! A lot of you tag me on Instagram (bakeritablog), but I also use the hashtag #bakerita, so tag your stuff and tag me so I see everything! Especially that grilled cheese ^^ enjoy! Lightly grease an 8 1/2" x 4 1/2" loaf pan. In a large mixing bowl, whisk together the flour, sugar, salt, baking soda, and instant yeast. Combine the milk, water, and oil in a separate, microwave-safe bowl or liquid measuring cup, and heat to between 120°F and 130°F. If you don't have a thermometer, the liquid should feel hotter than warm, but not so hot that is it uncomfortable to touch. Beat at high speed for 1 minute. The dough will be very soft. Add cheese and mix on low to combine. Scoop the soft dough into the pan and spread it out evenly. Cover the pan, and let the dough rise till it's just barely over the top of the pan. This will take about 45 minutes to 1 hour, if you heated the liquid to the correct temperature and your kitchen isn't very cold. While the dough is rising, preheat the oven to 400°F. Remove the cover, and bake the bread for 22 to 27 minutes, until it is golden brown and the interior temperature is 190°F. If you do not have an thermometer, the bread will sound hollow if you knock on the bottom of the pan when it is done. Oh yes!! I am going to make a gf version of this pronto! You are making me hungry!! Wait, instant yeast?! How have I never heard of this? I have got to try this out ASAP! And this would make such an ultimate grilled cheese. Yum! Please please do and report back so I can be jealous of the cheesy goodness :) thanks, Marissa! How have I not heard of this magical instant yeast either? And a grilled cheese would totally be amazing on this bread! This bread looks Perfect. With a capital p! 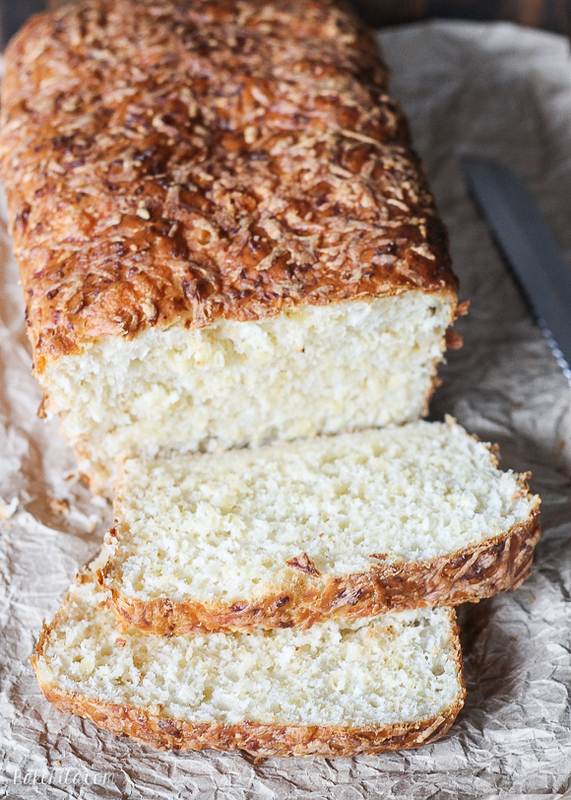 I can only imagine how great the buttery soft crumb of this bread pairs with cheese…yum! 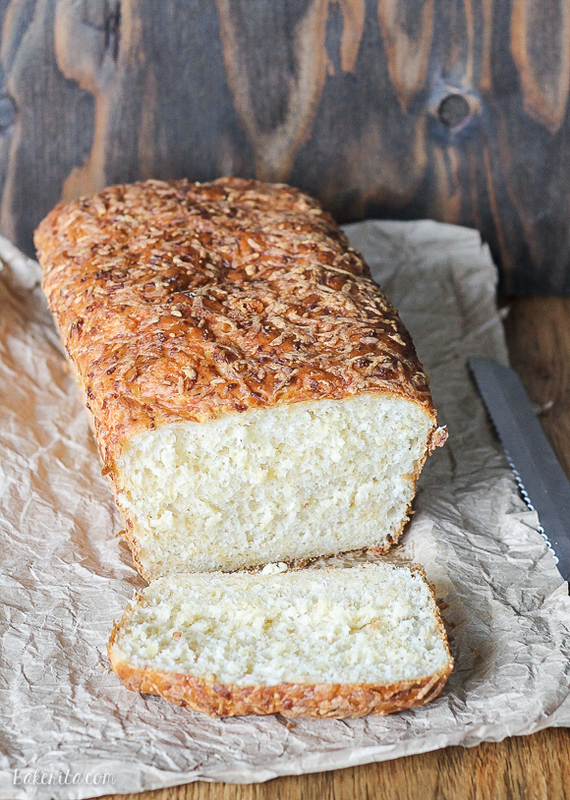 This bread would be delicious with Asiago too…any type of cheese, really :) cheese does no wrong! Thanks so much, Lynn. Mmmmmmm carbzzzzz :D I do have one question though, what is it that makes something “English muffiny”??? Like versus just regular bread? What would I do differently? There’s nothing you need to do different, it’s just the way that the bread bakes up has little nooks and crannies that give it a texture similar to an englsih muffin! Wow! This bread looks amazing! I’ve never been one to make my own bread, but this one seems doable! Oh wow! This must taste amazing! I love having the English Muffin bread recipe in my back pocket and seeing this one with cheese blows my mind. Yum! Gosh I love any kind of cheese bread! Looks amazing! I want this bread on a Grilled Cheese stat! lol Pinned! I can see why editing these photos made you hungry, I’m hungry just looking at them! My husbands’ parents live in a small town which has a bakery that sells english muffin bread, this looks like an even better version!! YUM! This bread sounds perfect, Rachel! I’ve always wanted to make english muffin bread and I think I found the perfect recipe. Love this cheesy version! you definitely had me at muffin bread. this looks like a great recipe and i love how it turned out! This bread is carb heaven! I am obsessing over it! It looks perfect, Rachel! Yum, homemade bread :). Homemade bread makes me happy! This looks so amazing with all that cheese baked into the top. Definitely going on my list! I am a major fan of cheesy bread.. well cheese and bread in general to be honest. This looks so tasty! 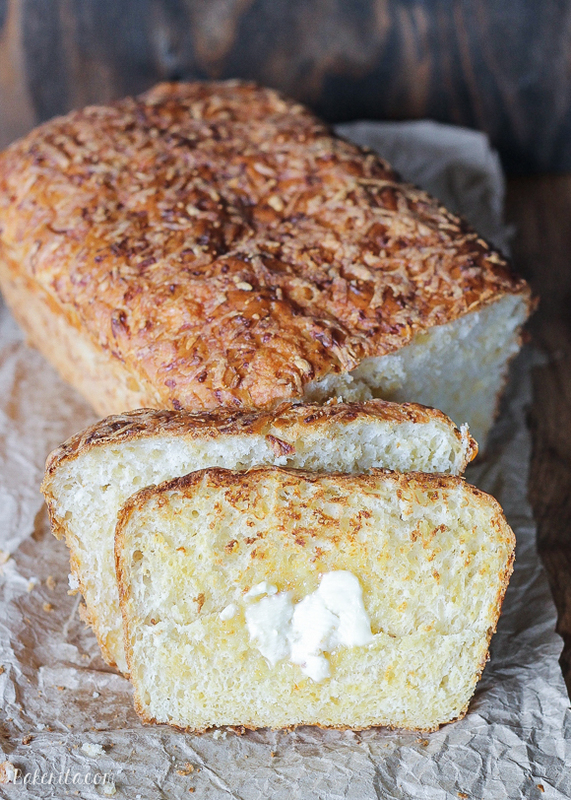 Rachel, oh my gawd, this cheesy english muffin bread looks amazing!!!! love! This bread looks so good! I have to try making it soon. I’m such a fan of English muffins, I’m sure this would be even better! Give me all the bread! I love English muffins, and this bread looks amazing! Oh my gosh, the texture of this bread is mind blowing! I am a sucker for english muffin bread and adding cheddar cheese to the dough is genius! Thanks so much, Kelly! I seriously wish I still had some, haha. I’m with you – instant yeast is really all I use anymore! This bread looks awesomeeeeee. That cheese! Filling bread dough with cheese before baking is brilliant! Have to try it! I can say no to pretty much anything except freshly made bread. And God, look at that fluffy slice, it’s heavenly, I need this in my life asap. Ooooh I’m intrigued by this instant yeast!! Sounds so easy. This bread looks amazing. Especially all toasted up with butter…. I WANTTTT!! OK – you had my attention at “Cheesy English Muffin”. No need to go any further – I definitely need to try this! The recipe sounds super easy, and I can’t think of one reason NOT to try a cheesy English muffin bread!! !